A tetraquark, in particle physics, is an exotic meson composed of four valence quarks. In principle, a tetraquark state may be allowed in quantum chromodynamics, the modern theory of strong interactions. Any established tetraquark state would be an example of an exotic hadron which lies outside the quark model classification. Colour flux tubes produced by four static quark and antiquark charges, computed in lattice QCD. Confinement in Quantum Chromo Dynamics leads to the production of flux tubes connecting colour charges. The flux tubes act as attractive QCD string-like potentials. In 2003 a particle temporarily called X(3872), by the Belle experiment in Japan, was proposed to be a tetraquark candidate, as originally theorized. The name X is a temporary name, indicating that there are still some questions about its properties to be tested. The number following is the mass of the particle in 7000100000000000000♠100 MeV/c2. In 2004, the DsJ(2632) state seen in Fermilab's SELEX was suggested as a possible tetraquark candidate. In 2007, Belle announced the observation of the Z(4430) state, a ccdu tetraquark candidate. In 2014, the Large Hadron Collider experiment LHCb confirmed this resonance with a significance of over 13.9σ. There are also indications that the Y(4660), also discovered by Belle in 2007, could be a tetraquark state. In 2009, Fermilab announced that they have discovered a particle temporarily called Y(4140), which may also be a tetraquark. 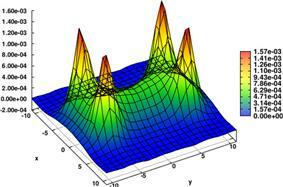 In 2010, two physicists from DESY and a physicist from Quaid-i-Azam University re-analyzed former experimental data and announced that, in connection with the ϒ(5S) meson (a form of bottomonium), a well-defined tetraquark resonance exists. ^ N. Cardoso, M. Cardoso, and P. Bicudo (2011). "Colour Fields Computed in SU(3) Lattice QCD for the Static Tetraquark System". ^ D. Harris (13 April 2008). "The charming case of X(3872)". ^ L. Maiani, F. Piccinini, V. Riquer and A.D. Polosa (2005). "Diquark-antidiquarks with hidden or open charm and the nature of X(3872)". ^ "LHCb confirms existence of exotic hadrons". ^ G. Cotugno, R. Faccini, A.D. Polosa and C. Sabelli (2010). "Charmed Baryonium". ^ Anne Minard (2009-03-18). 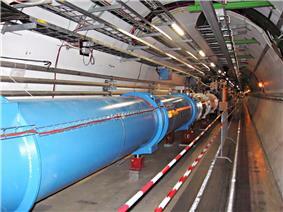 "New Particle Throws Monkeywrench in Particle Physics". Universetoday.com. Retrieved 2014-04-12. ^ "Evidence grows for tetraquarks". physicsworld.com. Retrieved 2014-04-12. ^ A. Ali, C. Hambrock, M.J. Aslam; Hambrock; Aslam (2010). "Tetraquark Interpretation of the BELLE Data on the Anomalous Υ(1S)π+π- and Υ(2S)π+π- Production near the Υ(5S) Resonance". ^ "Physics - New Particle Hints at Four-Quark Matter". Physics.aps.org. 2013-06-17. Retrieved 2014-04-12. ^ Eric Swanson (2013). "Viewpoint: New Particle Hints at Four-Quark Matter".